Kick it up Indian-style with this subtly spicy curry chicken. 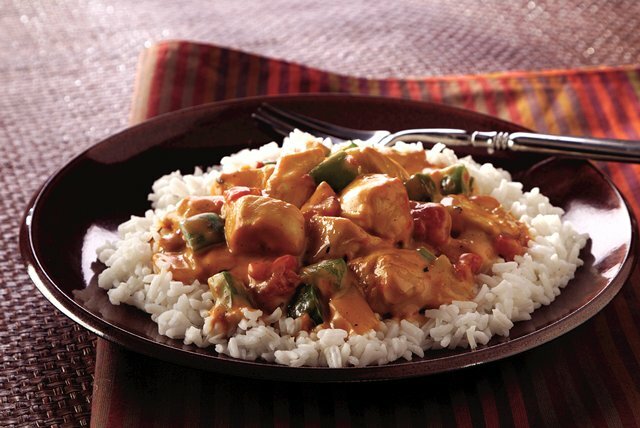 It only takes fifteen minutes to put Madras Curry Chicken together— but prepare for lavish praise! Melt butter in large saucepan on medium heat. Add green peppers, onions, garlic and curry powder; cook and stir until vegetables are crisp-tender. Add chicken; cook and stir 5 min. or until no longer pink. Stir in tomatoes, lemon juice, thyme and black pepper; simmer on low heat 5 min. or until chicken is done, stirring occasionally. Add VELVEETA; cook until melted, stirring frequently. Serve over rice. Combine green peppers, onions, garlic, curry powder and butter in 1-1/2-qt. microwaveable casserole; cover. Microwave on HIGH 3 min. or until vegetables are crisp-tender. Add chicken; cover. Microwave 6 min. or until chicken is no longer pink, stirring after 3 min. Stir in tomatoes, lemon juice, thyme and black pepper. Microwave, covered, 2 min. or until chicken is done. Add VELVEETA. Microwave, covered, 1 min. or until VELVEETA is completely melted when stirred. Substitute 2 pkg. (6 oz. each) OSCAR MAYER CARVING BOARD Flame Grilled Chicken Breast Strips for the cooked fresh chicken. Add to ingredients in skillet along with the VELVEETA. When thawing frozen chicken, place in refrigerator, allowing about 5 hours per pound of chicken. Never thaw chicken at room temperature due to the risk of bacterial growth.